Play is how children learn social skills. “Free” or unstructured play in early childhood is a very important way for children to learn about their world. When a child is playing they begin to develop social skills. They learn how to interact with other children and adults alike. As children grow older, they learn about rules by making up games with rules, as well as by winning and losing and figuring out how to “play fair”. This process of play also teaches children about negotiating and problem-solving. But, most importantly, play is for fun and relaxation. And fun plus relaxation is a great catalyst for learning new things. What are social skills and why do we need them? Social skills are the skills we use every day to interact and communicate with others. This statement sounds obvious, but it’s an incredibly complex process that most of us take for granted. Social skills include verbal and non-verbal communication, such as speech, gestures, facial expressions and body language. A person with strong social skills understands, almost intuitively, how to behave in social situations. Plus, this person understands both written and implied rules when communicating with others. A child requires strong social skills to engage in and maintain positive interactions with others and to make new friends. Social skills are also important for a child to understand another person’s perspective, and to recognize what that person is feeling (empathy). How do you know if your child’s social skills may be underdeveloped? Remember that play is also a learned skill. Learning to play isn’t easy for all children and that’s okay. These skills can be taught. Teaching a child to play in new ways helps them expand their speech language skills and encourages strong social skills. These skills help to improve a child’s daily interactions. What you can do to encourage play and social skills? Babies explore their world by using their senses. They like to put objects in their mouths, listen to sounds and look at mobiles or toys with bright colours and shapes. They begin to start playing games like peek-a-boo around ten months of age and by age one they may start copying adults (for example: imitate mommy talking on the phone). At this stage children enjoy constructive play (building towers, playdoh, train sets, etc. ), functional play and they may begin to pretend to be familiar characters such as a doctor, a teacher, a bus driver etc. They may play beside other children (this is called parallel play) and they may also start playing with other children. Children who are five years old and older enjoy playing with a group of children and they may enjoy more complex play (games with rules, board games, pretend play). Children at this age are beginning to co-operate and negotiate with other children to create new play scenarios. “More Than Words” by Fern Sussman. These two books are designed to give parents the tools to build their child’s play skills, while also promoting important social interaction and communication skills. The books use practical, easy-to-follow guidance to help parents build their child’s play during fun, everyday play activities. The two websites listed below provide valuable information about typical play development, how and when the different types of play develop and more in-depth information about play and social skills. If you have concerns whatsoever about your child’s play and social skills, speak to a child’s speech-language pathologist. Your child’s speech-language pathologist can help you identify your child’s social interaction and play skills, can answer any questions you might have and help you set appropriate goals for your child. 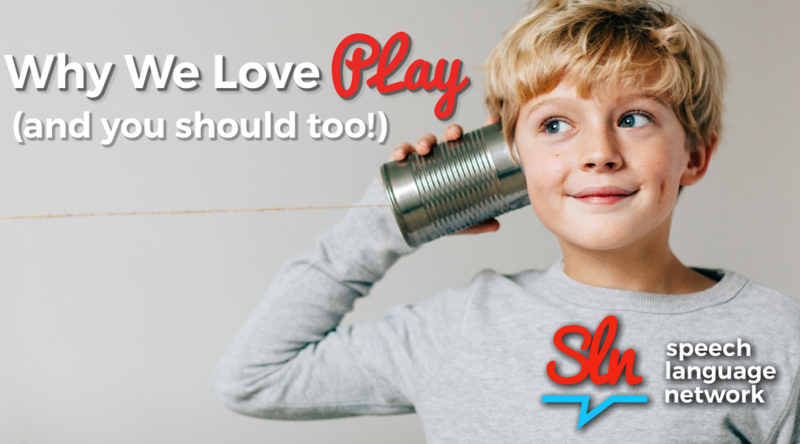 To learn more about our social language and play skills groups, please visit https://www.thesln.com.